Ontario’s new sexual violence and harassment legislation, Bill 132, An Act to amend various statutes with respect to sexual violence, sexual harassment, domestic violence and related matters, received Royal Assent on March 8, 2016. Bill 132 amends various existing statutes with respect to sexual violence, sexual harassment and domestic violence. For employers, Bill 132 presents important workplace-related changes, by amending the Occupational Health and Safety Act (OHSA) to require employers to implement specific workplace harassment policies and programs and ensure that incidents and complaints of workplace harassment are appropriately investigated. 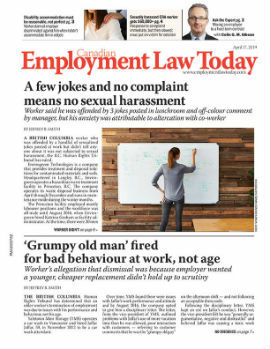 Bill 132, however, also clarifies that a reasonable action taken by an employer or supervisor relating to the management and direction of its workplace is not workplace harassment. how a worker who has allegedly experienced workplace harassment and the alleged harasser (if he or she is a worker of the employer) will be informed of the results of the investigation and of corrective action that has been, or will be, taken. Further, employers must conduct appropriate investigations in response to incidents or complaints of workplace harassment. Following an investigation an employer must inform both the worker who has allegedly experienced harassment and the alleged harasser (if he or she is a worker of the employer) of the results and of any corrective action that has been, or will be, taken. Notably, an inspector now has the power to order an employer to conduct an investigation by an impartial third party, and obtain a written report by that party, all at the employer’s expense. Bill 132, however, does not specify the circumstances in which an inspector can, or will, order an employer to conduct such an investigation. The above- noted OHSA amendments come into force on Sept. 8, 2016. In order to ensure compliance with the legislation, employers must take steps beforehand to update and implement policies and programs related to workplace harassment. Sabrina Serino practices employment and labour law with Dentons in Toronto. She can be reached at (416) 863-4385 or sabrina.serino@dentons.com. Sabrina's discussion of this case also appears in the Dentons blog www.occupationalhealthandsafetylaw.com.